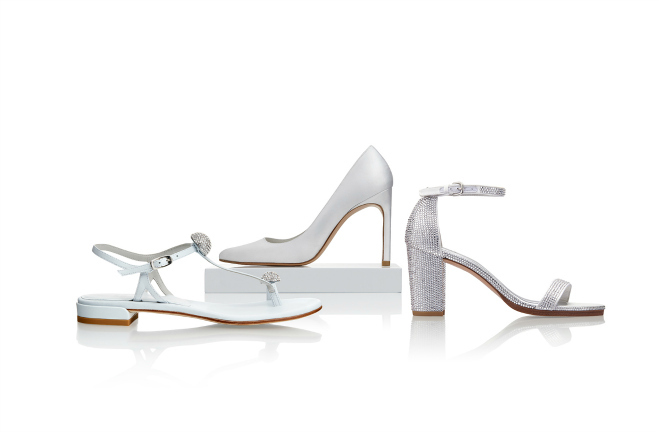 Stuart Weitzman, a global leader in designer footwear, is expanding its bridal collection to welcome some of the brand’s most iconic and sought-after silhouettes, set to debut on April 18th exclusively at stuartweitzman.com. The new collection will encompass 10 bridal styles central to the brand in three elegant fabrics. Brides can build their dream shoe by first deciding on fabric and color with white satin, argento noir, or platinum gold noir. Then their desired heel height, ranging from a kitten heel to a high heel peaking at 4 ½”. Followed by a few more options including the pointed-toe pump, round-toe platform pump, delicate d’orsay lace-up ballet flat, T-strap sandal, or stylish wedge sandal. Ultimately, there's a chic shoe option for every taste. Whether you're dreaming of an elegant satin white sandal, or adding some sparkle with Something Blue sapphire Swarovski crystals, the new collection is ready to walk the aisle at the beach, in the mountains, or at any upscale city venue. A very special addition to this collection includes a sweet personalization inspired by Mr. Weitzman himself. When proposing to his now wife of 50 years, Stuart Weitzman got down on one knee and offered his bride-to-be a shoe instead of a ring. The shoe was a one-of-a-kind with a lining inscribed with the words, “Made expressly for the future Mrs. Weitzman.” The new bridal customization program now offers brides the option of personalizing her own shoe with her new married name and wedding date. Swoon!